enrolled in an epistemology class. Within this class we discussed the importance for concepts to be clearly defined to advance nursing knowledge, research, and theory development. Though this is the case, when reading literature focused on relationship power, inconsistencies were revealed in how this concept has been examined and defined. Because of this, a need for clarification of this concept was identified. provided by Walker and Avant to assist in understanding this concept. As specified in this article, we propose the definition of relationship power to be the relative perceived, and actual ability to influence a relationship partner. this, it is extremely important for nurses in the clinical setting to be aware of what this concept entails. Doing so will help ensure they provide appropriate and comprehensive care to patients. Therefore, we hope that this article assists nurses with this. 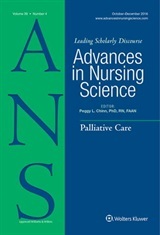 Furthermore, it is hoped that this article will assist nurse researchers in increasing consistency in their use of conceptual definitions and operational uses of relationship power. Doing so will allow for more directed future research in this particular area of science. We want to thank ANS for giving us the opportunity to share our developing work in this important area of nursing research.